Top this gratin with provolone and Parmesan or Gruyere cheeses. For a more Provencal approach, skip the cheese all together and top with bread crumbs, minced garlic, parsley, and olive oil. In a large sauté pan heat 2 Tbsp of the olive oil on medium high heat. Add the sliced onions and cook until lightly browned, stirring frequently, about 10 minutes. Add the sliced bell peppers and continue to cook with the onions until the bell peppers are softened and the onions are well browned, about 5 to 6 minutes more. When done, transfer the onions and bell peppers into a large gratin pan or casserole dish. While the onions and peppers are cooking, slice the eggplant and zucchini in 1/4-inch thick round slices. You’ll also want to slice the tomato into 1/4-inch thick slices, but depending on how big your tomato is, you may need to cut the tomato in half or in quarters first. All of the sliced vegetable pieces should be about the same size to make it easier to layer them in an attractive manner. Preheat the oven to 350°F (175°C). Spread the cooked onions and bell peppers in an even layer at the bottom of the gratin dish. Place the mashed garlic on top of the onions and peppers. 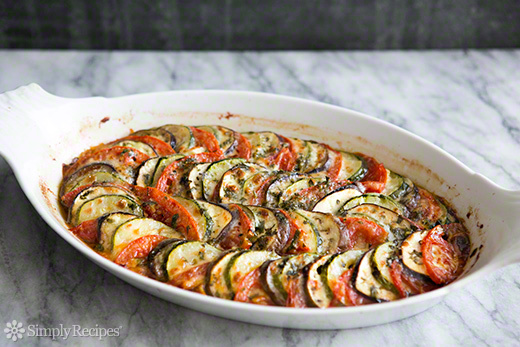 Arrange the slices of the eggplant, zucchini, and tomato on top of the cooked onions and peppers, alternating the vegetables, in an attractive pattern, stacking them and fanning them across the surface of the dish. Sprinkle with salt and parsley. Top with Provolone and Parmesan cheeses. Drizzle the remaining tablespoon of olive oil around the perimeter, where the vegetables meet the side of the dish. Cover with foil (it helps to grease the underside of the foil with a little olive oil so that the cheese as it melts does not stick to the foil). Bake for 40 minutes at 350°F (175°C). Remove the foil. Turn on the broiler and broil for 5 minutes or until nicely browned.